Today, when you order "Jonathan Pendragon LIVE", you'll instantly be emailed a Penguin Magic gift certificate. You can spend it on anything you like at Penguin, just like cash. Just complete your order as normal, and within seconds you'll get an email with your gift certificate. 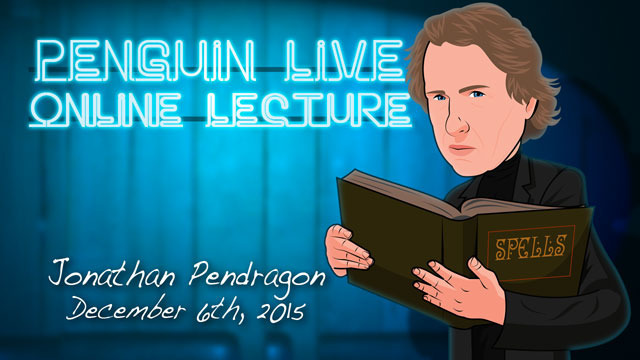 Jonathan Pendragon LIVE (Penguin LIVE) Lessons from the Grand Master of Grand Illusion. SUPPORT LIVE MAGIC. DOWNLOAD THE FULL LECTURE TODAY. Sands of the Desert The classic effect, in which three different colors of sand are poured into a bowl of water, mixed, and then extracted one color at a time. Jonathan has done extensive work on this piece, including his invention in which the water is left clear throughout. Canary Cage Another classic effect which Jonathan has updated and improved upon. As seen on Masters of Illusion this season, this is a faster, cleaner method with a seemingly effortless vanish. Cigarette Paper Tear A beautiful and delicate version of the Torn and Restored Paper trick, done with a cigarette paper. Intimate enough for a Close-Up show, yet also plays big enough for a Parlor or Stage show. The French like it better than his Metamorphosis! Capentro Jr. Two glasses and a coin are all completely examinable. One glass is used to cover the other, held by the spectator, then the coin penetrates the glass into the interior. A completely portable and immediately examinable Coin in a Bottle trick done with everyday objects. Infinite Improbability Thirty years of work and study have led to this seemingly impossible card trick. Seen on Don’t Blink this season, it is the most requested trick in Jonathan’s current Close-Up show. He will be revealing the methodology here for the very first time. Making your own card sword Jonathan has used many of the best card swords available, but was never felt that any of them looked like a real sword. So he designed his own, more “practical" looking sword which he uses regularly. Cyrano A card sword routine incorporating card manipulation, theater, and rousing audience participation. With a deck of playing cards, a card sword, and this routine you can fill a stage — the ultimate in “packs small, plays large." Helicopter cards Jonathan approaches the Slydini classic with a new methodology that doesn’t demand the original eccentric performing style. World’s Greatest Feat of Magic Jonathan’s most famous card trick, presented as a closer by numerous big-name card men and was featured on this season's Don’t Blink. This piece blends prestiDIGITation, strong visual magic, and bad puns. Jonathan Pendragon has performed at three Presidential Galas in Washington D.C., for the Queen of England, the Prince of Wales and the Royal Family of Monaco. He is the youngest performer to ever receive a Performing Fellowship from the Academy of Magical Arts (the governing body of the Magic Castle). 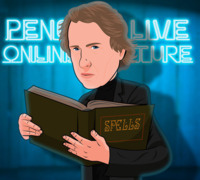 He is the Grand Master of Grand Illusion: Jonathan Pendragon. At the turn of the millennium, MAGIC magazine created a list of the 100 most influential people in the history of 20th Century magic. The list included Harry Houdini as well as more contemporary artists. Jonathan was one of only a handful of current performers named. David Copperfield said that “When the history of magic is written, Jonathan Pendragon will be remembered as one of its most creative performers.” Siegfried (of Siegfried and Roy) declared him a “Genius!” International magicians from Hans Klok to Criss Angel have identified Jonathan as one of their greatest influences. Jonathan is a graduate of the University of California at Irvine with a degree in Theater, and it was there that he began to develop his trademark highly-physical performance style. Immediately following graduation, he found work in the film industry as both an actor and a stuntman. Jonathan’s gift for Illusion put him both in front of and behind the camera. Creating the famous “back handsprings down the church aisle” scene in THE BLUES BROTHERS, Jonathan worked with director John Landis and actor John Belushi to create the illusion that it was actually Belushi doing the tumbling. He worked several years for CIRCUS OF THE STARS, teaching and performing with actors like William Shatner. Beginning in the early 80s, Jonathan began to develop a wholly unique form of magic, “Physical Grand Illusion.” This style of Illusion put the emphasis on the physical performance instead of the prop. At a time when magician after magician presented larger and larger illusions on television, some of which were elaborate camera tricks, Jonathan wowed international audiences with illusions based on years of physical training, including dance, gymnastics, and martial arts. He created The Pendragons, an illusion team who were as spectacular in their appearance and movement as anything they presented. Metamorphosis, their most famous illusion, involved a split-second transposition that would have fooled Houdini (the illusion’s inventor), according to the 2005 50th Anniversary Edition of the GUINNESS BOOK OF WORLD RECORDS. Many of today’s most popular illusions were invented by Jonathan Pendragon: including Clearly Impossible, the most deceptive “sawing a woman in half” illusion ever invented, and the Fire Cage, the most popular assistant production in the world. He created and staged the opening illusion for Norman Jewison’s film BOGUS, and designed effects presented by the most famous names in magic. 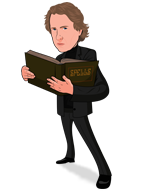 Jonathan Pendragon’s work in the field of magic has encompassed everything from street magic to the largest illusion ever presented on stage (vanishing 25 showgirls for the TV special WORLD’S GREATEST MAGIC). He has written books on the philosophy of the art, and lectured internationally. He was twice named Magician of the Year by the Academy of Magical Arts, and has won the Grand Prix de Magique de Monte Carlo. The World Magic Awards has twice named him Best Illusionist and, in 2000, Magician of the Year. Jonathan appeared in at least 14 prime time network television specials in the United States, and starred in the most elaborate magic special ever filmed: DISNEY’S NIGHT OF MAGIC, shot in Disneyland Paris. He has performed on television in approximately 50 countries around the world, and graced the stages of the Kodak Theater in Hollywood, the Palladium in London, the Olympia in Paris, the Wintergarten in Berlin, the Theater an der Wein in Vienna, the Toledo Opera in Spain, the Beijing Opera House in China, and the Music Hall in Cincinnati, where he created an evening of illusion presented in front of a symphony orchestra conducted by Erich Kunzel (a performance which was repeated at the Detroit Opera House). He gave a special performance at the foot of Mt. Fuji, in Japan, which was broadcast all over the country. Recently he appears regularly on three different magic television series, showcasing his versatility and skill in multiple styles: MASTERS OF ILLUSION on the CW network, DON'T BLINK on the Pop Channel, and EXTREME ESCAPES, on Reelz. Purchase the Jonathan Pendragon LIVE product. This is your ticket. Sit back and watch over 2 hours of DVD-quality live streaming magic from the comfort of your own home. It'll be waiting for you in your MyPenguinMagic area. This was a lovely lecture, with a good mix of stage effects and close-up/card magic. I felt his explanation on the construction of the card sword to be quite thorough, and I like this one in particular because it doesn't have a tendency to "catch" and screw up. That is great alone, but Johnathan went to the next step, and made it an entire performance piece, one that looks as fun as it is dramatic. He shows you how he applies black arts to his stage props, and explains in a very clear manner how and why these props are made. His improvements to the zombie ball are really quite interesting. I found his vanishing cage to be really baffling even when he was literally explaining to me how he was doing it. All-in-All, I thought this was a great lecture! The dramatic deaths of the audience had me in stitches. I really enjoy it when these lectures bring in such theatricality and showmanship. Great lecture from a great and honest performer! Many inspireing and original routines, interesting stories and a deep, moving personal story - one of the absolute best lectures!! Thank you, Jonathan!!! This was a great lecture on many levels. First, because Jonathan's story is one of redemption. He had some problems which he mentions, but he has come out the other side much better for it. It is tremendous to see him doing well, in many ways better than he has ever been. Jonathan is one of the nice guys in magic (I've only worked with him a couple of times, but it was clear that he tries to help anyone who asks).Second, the lecture is good because Jonathan's love of his art shines in his work. This is not just a here's a trick, here's how to do it. It is much more a here are some tools, here are some ways to use those tools to turn a trick into magic. Third, it was great because of the depth to which Jonathan goes to explain and really teach the work. He want's the listeners to truly learn and goes out of his way to make things very clear. He is a natural teacher and it shows. All in all this was a truly incredible four hours. Even if you never do any of the pieces from the lecture, you will still learn much from the explanations. Highly, highly recommended. After all the challenges that Jonathan has dealt with in recent years, it is good to see him lecturing and performing again. He is one of the great masters of illusion, and he also does "intimate" (close-up) magic with his audience. All the effects were from his own repertoire, and they were all A+ material. Whether you do stage, parlor or close-up, you will definitely find effects that you can use in your own act. This lecture is priceless. Well done Jonathan and well done Penguin!! The lecture by Jonathan Pendragon was one of the few lecture one can find on stage magic by one of the most influential contributors in Grad Illusion today. In my opinion finding good magic for stage performers is much more difficult then for close up magic. It was very entertaining, intimate, with useful material. Sands of the Dessert is an old "chestnut" with some issues and Jonathan solved the problem and made it an excellent stage piece. There was also a card routine for stage magicians, again a rarer commodity. I was very pleased at "meeting" Jonathan in this lecture and seeing the Man and the Magician he has become. I strongly recommend this lecture. I would be interested in seeing a second lecture by Jonathan. You’re reading that right, Jonathan Pendragon is the real deal and a true wizard. This four and a half hour mega event is not to be missed. We get to see Jonathan in a new light as he teaching a nice mix of close-up and stage effects. He starts with his version of sands of the desert. His version is the best, safest, most direct and versatile version of the effect you can learn. Jonathan teaches you everything from the sand to use, to how to make the bowl you use for the effect. If you think an audience won’t be fooled by this effect you are mistaken. With Jonathan’s method even a smart audience will find it had to determine the clever secret. Jonathan teaches the ins and outs of his Canary Cage, which vanishes in the blink of an eye. Even if you don’t ever perform this effect you will love his thinking and construction of this timeless classic. To say it happens in the blink of an eye is unfair, you can keep your eyes open and still be fooled by it. Jonathan then talks about his take on the coin through glass, and misers dream. Both use a clever something that anyone could build and they both look magical. He also shares his love for black art as he presents his take on the classic zombie ball using a glowing sphere of light. This is a winner. Also his safety for a Russian roulette style routine is the single safest and practical way to do the effect without danger. Trust me this idea changes the whole game. Jonathan gives Penguin views an additional treat by showing us his opening cups and balls sequence. The balls do things we all know they can do but in a wizard’s hands the magic is made so much stronger. Then comes the card sword, I know what some of you may be thinking, “What’s so good about a card sward?” , to answer it in a word, EVERYTHING. Jonathan teaches you how to make a sword that can fit in a suit case, gives visual magical impact, won’t stick, never fails, and won’t break the bank to make. If that’s not enough, he then treats us to a performance and explanation of Cyrano, the single best card sword presentation I have ever seen. He rounds out the lecture with some excellent card work and a Cigarette Paper Tear that is just beautiful. However, he’s not done yet as Jonathan gives one of the best post lecture interviews I’ve see here at Penguin. Over all, if you are a stage performer (beginning or professional), a creative thinker or just love the art of magic you owe it to yourself and your magic to learn from a true wizard. Jonathan’s lecture is fun, filled with stories, and shows use the level of respect we all should have for magic. Magician, Artist, Creative, Natural... very nice person... all mixed together and you will have a very nice Lecture!! Thanks for your time Jonathan! I had heard of Jonathan Pendragon. I wasn't familiar with his work but knew that he did a lot of stage illusions. so I picked this up on a whim--over many other options, not knowing what to expect. I was pleasantly surprised. the entire lecture is great! Fantastic performances and practical breakdowns of the effects. The end of the lecture is most inspiring where he sits down with Dan and completely opens up about all his (then) recent issues. Jonathan is a great artist, and definitely a great wizard. This lecture is entertaining,fun and filled with interresting tricks to learn!